"People do not engage in self-injury [or] aggression...solely because they have...developmental disabilities. There is logic to their behaviour, and functional assessment is an attempt to understand that logic"
What is a Functional Behaviour Assessment? A Functional Behaviour Assessment (FBA) is not one single thing; it is a broad term used to describe a number of different methods that allow researchers and practitioners to identify the reason a specific behaviour is occurring (Cooper, Heron, & Heward, 2007). These assessments are typically, but not exclusively, used to identify the causes of challenging behaviours such as self-injury, aggression towards others or destructive behaviours. Although there are different methods for carrying out functional assessments, they all have the same goal: to identify the function of a challenging behaviour so an intervention can be put in place to reduce this behaviour and/or increase more adaptive behaviours. 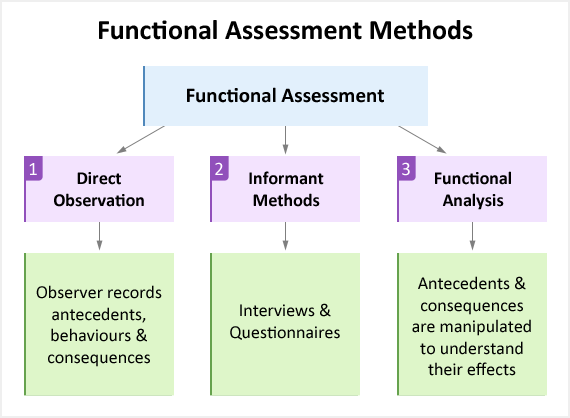 There are three specific functional assessment methods: (a) Direct Observation, (b) Informant Methods, and (c) Functional Analysis. The terms "functional assessment" and "functional analysis" are sometimes thought to be the same thing but they are not; a functional analysis is one specific type of functional assessment. Three types of functional assessment: direct observation, informant methods and functional analysis. Depending on the textbook you read, the names for these three methods can differ slightly. If this is your first time getting into this topic then these different names could cause some confusion. Under each of the assessment methods below, we’re going to list the different terms that are used to try and reduce any confusion. For direct observational methods, an observer would watch the client engage in activities within their natural environment. When the challenging behaviour occurs, the observer would record what happened just before it, what happened just after it and also take notes on what they perceive to be the potential cause of the behaviour. This method is used to develop a hypothesis about the function of the behaviour. Descriptive Functional Behaviour Assessment (Cooper et al, 2007). The informant method involves interviews and questionnaires that can be completed by the client, their parents, staff members, teachers etc. These interviews would be used to identify what is happening before the behaviour occurs and then what happens after the behaviour. Just like direct observation, this method is also used to develop a hypothesis for the function of the behaviour. The term used for the third method is the only one where there is consensus among all three authors (Cooper et al, 2007; O’Neill et al, 1997; Miltenberger, 2008). This method is called functional analysis and involves practitioners deliberately changing what happens before and/or after the behaviour in an effort to test what might be causing the behaviour. Unlike the other two methods that are used to create a hypothesis, this method is used to actually test the hypothesis and is the only method that can truly predict when the behaviour will occur. Both direct observation and informant methods are "descriptive assessments" because they describe what is happening before and after the challenging behaviour. These two methods only provide correlational data; this means that, while you may be able to use the information gathered from their use to create a hypothesis (accurate guess) about the reason the behaviour is occuring, only the third method the functional analysis can truly identify the function of the behaviour. A functional analysis can do this because it is an "experimental assessment" that manipulates what happens before and/or after the challenging behaviour while continuously recording data to see which manipulation leads to the highest frequency of the behaviour. The process of this experimentation can be seen in our hypothetical example of a functional analysis. When a child engages in a challenging behaviour (e.g. self-injury) it can be extremely confusing for the parents and staff members working with them. They may be left scratching their heads wondering what is happening because 'such patterns of behaviour do not fit with the way we think the world should work and often don't make sense' (O'Neill et al, 1997, p.3). In these situations it is important to note that all behaviours have a function. When we say a behaviour has a "function" we basically mean the reason the behaviour occurs in terms of what it gets the person (e.g. gets them attention or gets them out of having to complete academic tasks in class) and a functional assessment allows everyone involved with the child to understand this reason. As stated by O'Neill et al (1997, p.3), 'one of the goals of a good functional assessment is to bring clarity and understanding to otherwise chaotic and confusing situations'. While functional assessments are a professional standard, there are considerations that have to be taken into account before conducting one. For example, it may be unethical to use a functional assessment, particularly the functional analysis method where deliberate manipulations are made that effectively encourage the client to engage in the target behaviour (O’Neill, et al 1997). This may be unethical because if you consider a child who engages in self-injury or aggression towards others, there is the question of whether it is acceptable to deliberately test different antecedents and consequences that will lead to the child injuring themselves or another person. Strategies would have to be developed to protect the individual and those conducting the assessment. In this situation anyone involved with the client (the client themselves if possible, parents, staff, practitioners etc.) and any legal review boards or committees within the jurisdiction must be consulted and informed consent obtained before any assessment is carried out. There is also the issue that behaviours may be occurring as a result of a medical or physical condition. For example, sinus or ear infections, mouth ulcers, allergies, toothaches, constipation etc. may induce or worsen a challenging behaviour (O’Neill, et al 1997). It would be extremely important that any medical or physical condition is ruled out so that a behavioural intervention is not implemented needlessly and to the detriment of the client. A functional assessment is, in effect, an information gathering process. A clear description of the challenging behaviour. A description of what is happening before the behaviour occurs; to include the environment and behaviours of other people within it. Within behaviour analysis, this would be called the "antecedent". A description of what happens after the behaviour occurs; again to include the environment and the behaviours of other people within it. This would be called the "consequence" within behaviour analysis. The identification of desirable behaviours that the child can already engage in so they may be used to “compete” with (substitute) the challenging behaviour. For example, if a child can already make requests, then they could be taught to say “please go away” instead of screaming or becoming aggressive. The identification of events or people within the environment that are creating extra motivation for the client to engage in the challenging behaviour. For example, one specific staff member may keep forgetting to give the student their favourite toy over lunch time and the child engages in the challenging behaviour during this time period because it “reminds” this staff member to give them the toy. The development of a hypothesis outlining the potential functions of the behaviour (reinforcing consequences) e.g. getting the attention of the staff members or getting out of having to complete academic tasks. A full history of the interventions that have been previously implemented and the successes/failures of those interventions.